Location: Osmarski kashti holiday complex is located in the village of Osmar, just 15 km away from Shoumen. The hotel is located in a picturesque area, well known for its famous absinth drink pelin, and other aromatic wines. 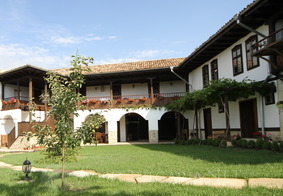 Accommodation: The complex offers accommodation in one traditional renovated house, as well as one new building. All rooms feature rustic-style decorations and solid wood furniture, as well as access to a common terrace. Further facilities include free Wi-Fi, flat-screen TV and a private bathroom. Wine & dine: The mehana of the complex offers is decorated in a traditional old Bulgarian styles. Here you will be treated with homemade and typical of the area dishes. Spa & relax: Free access to a sauna and a fitness room is also available for guests of the hotel.